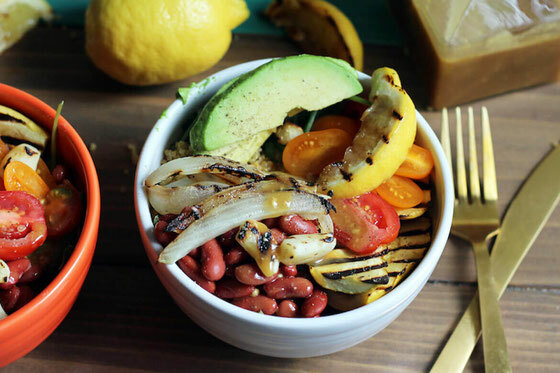 Love one-bowl meals? 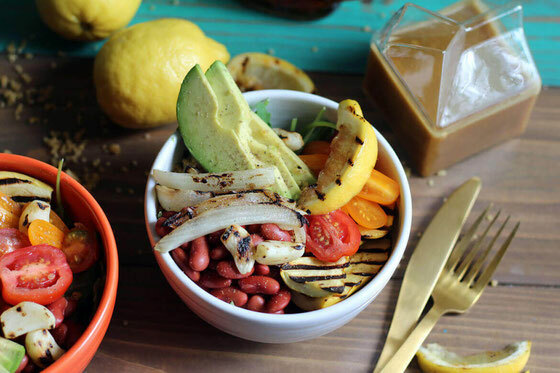 Then this maple Dijon vegetarian grain bowl will quickly become a household favorite! The gluten-free, vegan dish is packed with in-season veggies, and the dressing combines pure maple syrup with Dijon mustard. I recommend doubling or tripling the dressing recipe so you have enough on hand for flavoring other salads, bowls, and even sandwiches throughout the week! Thanks to the folks at Pure Canada Maple for sponsoring this blog post. All opinions, as always, are my own. Lately, I’ve been kinda obsessed with coming up with the perfect grain bowl recipe. 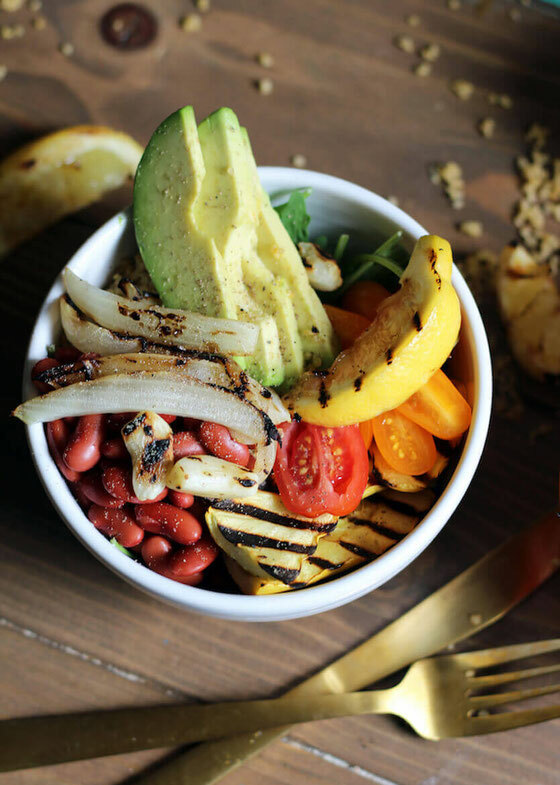 Since summer is around the corner, I wanted to incorporate my favorite seasonal ingredients—ahem, grilled veggies!—to create a meal that tasted, well, like sunshine. I also wanted to create a recipe that’s vegan and gluten free. I have many summer events coming up, with guests that have varying dietary restrictions. So whipping up a dish that meets all those needs means happy guests, as well as easier hosting. I decided on quinoa as the main grain for the vegetarian grain bowl, arugula as the leafy green, kidney beans as the plant protein, and avocado as the healthy fat. Then I grilled up a bunch of my favorite veggies, including summer squash and Vidalia onions. I also grilled some garlic cloves and sliced up a bunch of grape tomatoes. Then comes the maple-Dijon dressing, with such a delicious flavor. While honey is often used in Dijon dressings to balance out the spicy tang of mustard, I decided on maple syrup because it adds complex flavor notes and also because using it in the recipe means the dressing is vegan. Speaking of maple syrup, did you know that Canada produces more than 70 percent of the world’s maple syrup? Most of this production happens in Quebec, where I’ve visited a handful of times—both as a young girl and as an adult. I always enjoyed sampling the many maple products, from the syrup itself to candies sweetened with it. (Yes, even dietitians love occasional indulgences!) What I didn’t know then is that the syrup’s taste is directly impacted by when in the growing season the sap used to make it is gathered. Sap gathered at the beginning of the season, typically in March, yields syrup with a delicately sweet taste. Toward April, the sap produces syrup that’s darker and more caramelized, with a more robust taste. How cool is that? And pure maple syrup from Canada offers a lot of beneficial nutrients. You definitely can’t say the same about table sugar! These nutrients include manganese, a mineral that helps control blood sugar and support healthy muscles, as well as riboflavin, a B vitamin that plays an important part in the body’s cellular function. Maple syrup contains 60-plus polyphenols, aka health-helping antioxidants. One of these polyphenols forms when sap is boiled to create maple syrup and is called Quebecol, after the province of Quebec. When talking about added sugars such as maple syrup, it’s important to note that The American Heart Association recommends limiting them to 2 Tablespoons (6 teaspoons) per day for women and 3 Tablespoons (9 teaspoons) for men. While I don’t use a lot of added sugars in my recipes, this daily amount leaves some wiggle room for adding a little sweetness to recipes, such as in a morning smoothie, overnight barley breakfast bowl, or in a baked good like muffins or mini cakes. I like to use maple syrup in such recipes not only because of its unique flavor profile but also because of the many health benefits it offers. 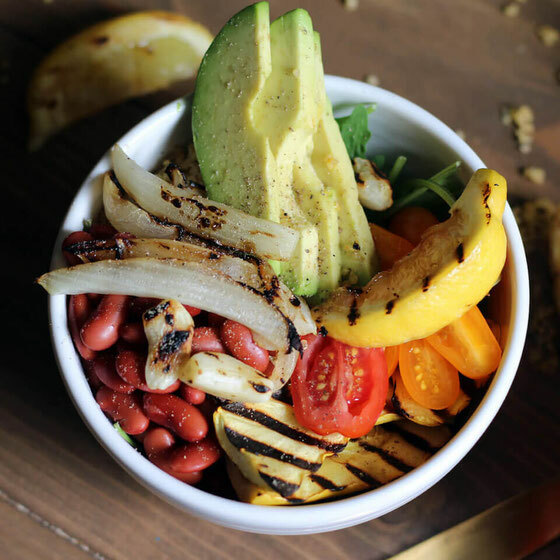 I hope this vegetarian grain bowl quickly becomes a staple in your household! Spray a grill or cast-iron grill pan with spray oil. Grill onions, garlic, and squash over medium-high heat, flipping once, until desired tenderness. Grill lemon wedges until slightly browned, turning once. Meanwhile, combine olive oil, vinegar, maple syrup, and mustard in a sealed container, such as a mason jar. Shake until well combined, and set aside. Place a bed of arugula in two bowls, and top with quinoa. 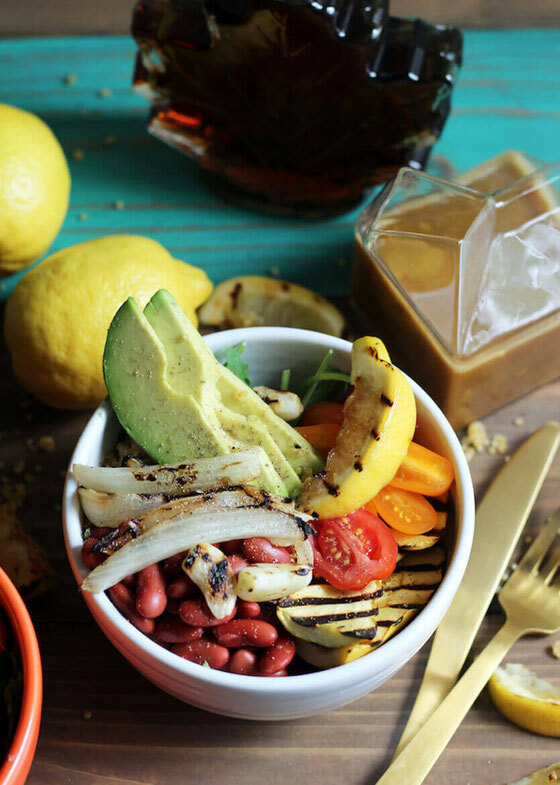 Add grilled vegetables, tomatoes, kidney beans, and avocado. Season with salt and pepper; drizzle with maple-Dijon dressing. Add lemon wedge, and enjoy immediately. Makes 2 servings. What are your thoughts on this topic? What are your favorite vegetarian grain bowl ingredients? How do you use maple syrup in your cooking?